VBRC2 is an evolved planetary nebula in the southern constellation of Vela, discovered as a planetary nebula by van den Bergh et �al. in 1973, about 3,900 light years distant. �The white dwarf (small central �blue star) is shown in the image. �The nebula is also referred to as Wray 17-31, ESO 166-PN-21 and �RCW 44. 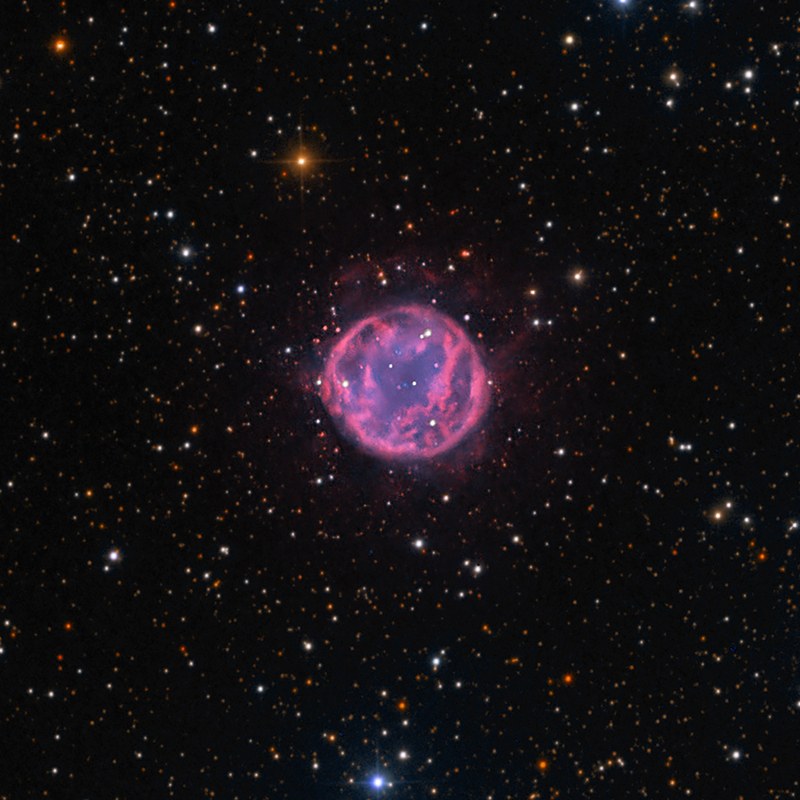 �The bright portion of the nebula is circular and about 2.5′ in diameter. �North is up and East is left. �The deep narrowband data also detected an extended halo present in both OIII and [H-a + NII] that expands the size to about 4′. 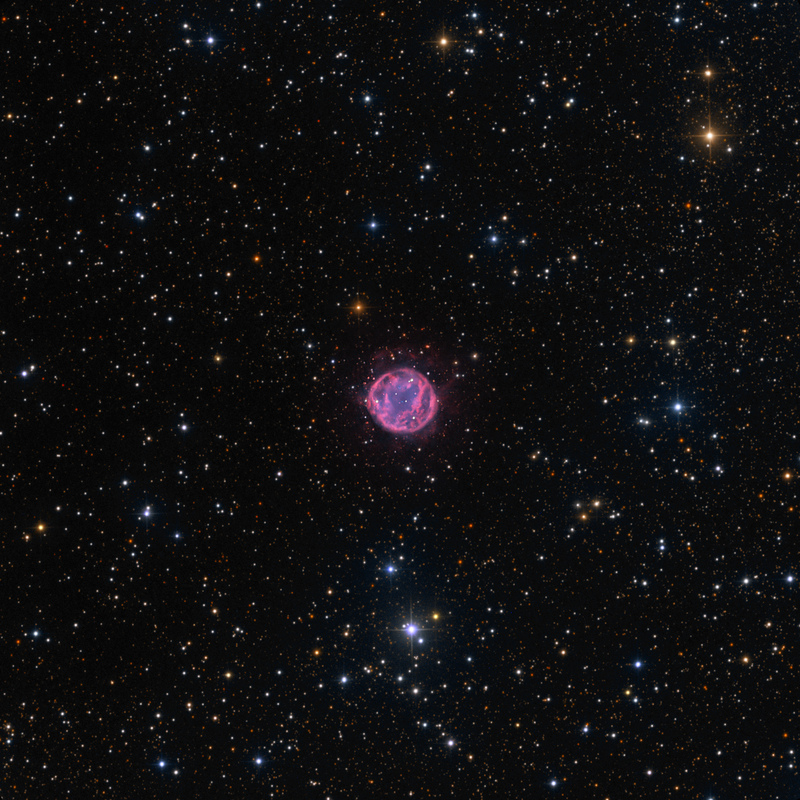 �The internal structure has elongated cloudy structures, and shows a resemblance to my narrowband image of Abell 7. �The central white dwarf DAO (hydrogen/helium-rich displaying Helium ionization) star is one of the hottest and most evolved known for a planetary nebula. �This image is the first to clearly show the extended halo structure, which was discovered by the Galactic Planetary Nebula Halo Survey (GPNHS) team�in August, 2014. ��A 27′ x 27′ expanded image is shown below. I love this halo! I wish I could see it imaged at higher resolution.